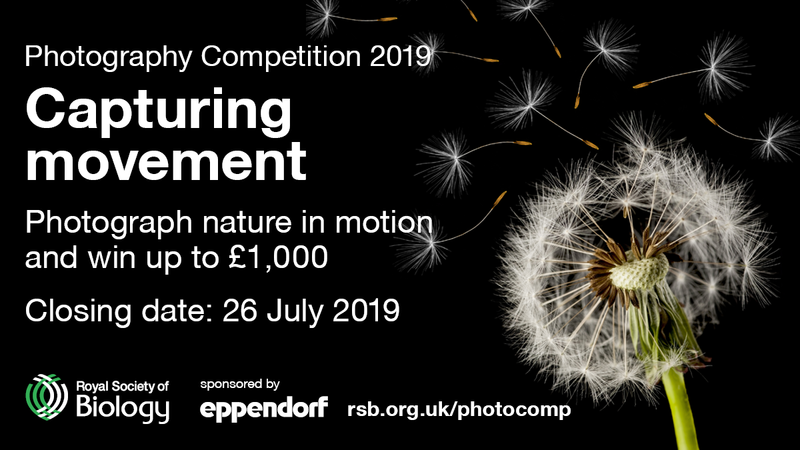 The Royal Society of Biology annual photography competition invites amateurs to submit photographs on a particular theme. Capturing movement’ is the theme of this year’s competition. Life on Earth is constantly changing, and we invite you to photograph nature in motion. The competition is free to enter and is open to Society members and non-members. Entrants must not be professional photographers. For the purposes of this competition, a professional photographer will be considered to be someone who makes more than half their annual income fromphotography-related work. There are no restrictions on the type of camera used but it should be noted that part of the judging criteria will be technical excellence and it is therefore recommended that you use the highest possible quality setting on your camera. The original file should be as large as you can achieve with your equipment. The copyright of the entire image must belong to the entrant. Entrants will retain copyright in the photographs that they submit. By entering the competition entrants grant the Organisers a non-exclusive, worldwide, royalty-free licence to use, reproduce, and publish images entered into the competition for the purposes of: a) Publicising and promoting the competition, b) The Organisers’ activities, including within their publications, website and social media channels.Contact the Organisers at competitions@rsb.org.ukif you have any questions about use of images.